Spring is really springing up all around town. Friday we heard the first Sandhill Cranes out at the Lee & Rose Warner Nature Center and Red-shouldered Hawks have arrived as well. The sap is running in the maple trees and snow is melting at an incredible rate. The woods have turned to mud. There's another sign of spring however. I'm holding it in my hand. 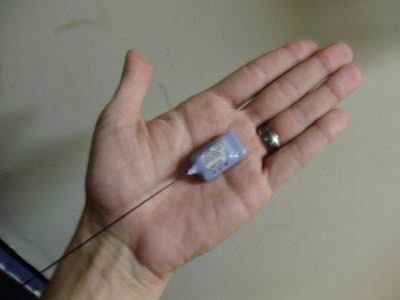 This is an Advanced Telemetry Systems R2020 transmitter. It weighs 12 grams and is designed to be glued to the carapace of a Blanding's Turtle. We have a special permit from the Minnesota DNR to capture and radio track the threatened Blanding's turtle's that live at the nature center. The new transmitter just arrived today and that is a sure sign of spring as well. The turtles won't start basking for another month but when they do we'll be ready. I've gotten better at catching them over the years. I'm excited for the challenge.